On 6 May 2015, Artists Tim Collins and Reiko Goto invited a distinguished panel of scholars, artists and poets to discuss the meaning and evolution of Gaelic place names in the region between Loch Rannoch and Loch Tay, in the southern highlands of Perthshire, Scotland. 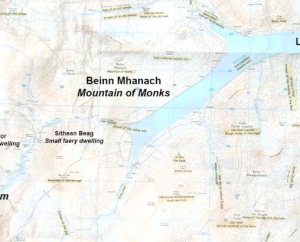 The map and this video is part of a larger body of research and artwork that is focused on ideas about Future Forest, the Black Wood of Rannoch and its wider landscape context. The video consists of a excerpts from a conversation amongst Alec Finlay an artist and poet, Anja Gunderloch an expert n 18th century Celtic literature, Jake King an expert in the terminology and meaning of the Gaelic landscape and John Stuart Murray a biologist and a landscape architect; all are recognized experts in the literature and language of Scottish place names. Much of the discussion focused on literary traditions and the contributions made by the 18th century Scottish poet, Duncan Ban MacIntyre (Donnchadh Bàn Mac an t-Saoir). The discussion focused on landscape features in the south west of Breadalbane where the poet lived. Songs/poems include ‘In Praise of Beinn Dorain (Moladh Beinn Dòbhrain)’, it means ‘hill of the small stream. MacIntyre praised the nature and described the beauty and the wild deer that belonged to the area. The discussion also touched on ‘The Song of the Misty Corrie (Coire a’ Cheathaich)’ and the descriptions of an ideal landscape which is later described as spoilt in the ‘Song of Lament for the Misty Corrie (Cumha Coire a’ Cheathaich). The conversation brought our attention to small landscape features such as ‘Sithean Beag’ (small faery dwelling) and ‘Sithean Mhor’ (large faery dwelling) which had remained un-translated on our map. They also provide insight about place names like ‘Druim Nan Cran Saighde’ (the ridge of arrows) perceived by many to be a site of conflict with some relationship to ‘Glen Sassunn’ (The Saxon Glen). But the discussion focused on arrow-wood harvest, tool making and craft that were once found in the pine forests.